Our heating systems are one of the most important features of our home, providing heat and hot water throughout the year. In fact a boiler breakdown is almost inconceivable, as to be left without heat for days during the height of winter would be a nightmare. But this happens because homeowners neglect their boiler whilst it’s working without a hitch. The problem is a fault could strike at any time, without warning. When this happens you don’t want to be paying the world to have the issue repaired. A boiler service should be carried out annually, to ensure the system is working efficiently and there isn’t a hidden problem that could cause a fault. Services will also bring up other dangers such as carbon monoxide leaks. Monoxide poisoning affects hundreds of residents every year and is almost impossible to detect because the gas is both odourless and colourless. Sometimes the worst does happen and our boiler will breakdown. Getting the problem fixed as quickly as possible is a top priority so you’re not left without heat and hot water for longer than necessary. 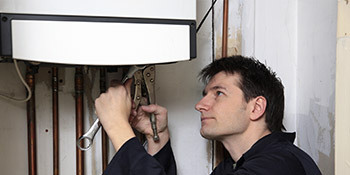 A boiler fault could unfortunately be anything, and the cost associated will change depending on the problem. In the middle of winter the price of call-outs and repairs can double and a boiler of over 10-years-old is more likely to fault at this time. Our advice would be to consider investing in an A-rated efficient boiler to replace your old, inefficient system. This way you’ll reduce your bills and ensure a fault doesn’t happen in the near future. If your boiler is in desperate need of a service or you’ve suffered a breakdown and need an engineer urgently to come out and make repairs, complete our quick form. We’ll do all the hard work and match your enquiry with up to four vetted and reputable contractors so you can compare quotes and ensure to get the right price. Project: Boiler cover only with annual inspection and service. I have nothing but praise for this company. Paul, the local hero, came out to fix my dad's boiler at 5 pm on a Friday and was so helpful in explaining what the problem had been. He had a very nice manner and was our hero for sorting the problem out when the company my dad has a service contract with, let him down, badly. Thank-you, Local Heroes! They did what was asked very pleasant to have a company that arrives on time and does the work without any problems. I was happy they provided me with a suitable contact to repair my heating boiler. Told me exactly what he was doing. Here when he said he would. Got on well with the job. The below data demonstrates the energy performance of homes in Uk. Energy ratings vary from A to G, with A being the most energy-efficient and G being the least efficient. The Energy Performance Certificate (EPC) rating comes into play heavily if you want to sell your household, as possible buyers will see what amount they're probably going to be paying for their home heating bills. Property upgrades including insulation help to significantly boost a home's EPC rating. The information underneath indicates the different types of homes within Uk. By far the most common homes throughout the United Kingdom are detached and semi-detached properties. Other kinds of homes consist of terraced houses, flats, converted flats and bungalows. The pie chart underneath displays the proportion of households in Uk that are central heated and non-central heated. Central heating figures within the vast majority of UK houses, which includes those on the gas grid and homes heated by oil and electric. The data beneath shows the spread of homes heated by various fuels. Around the United Kingdom the most frequent by far are gas heated homes, followed by electricity and then oil. Biomass central heating boilers are also growing in popularity, heated by environmentally friendly products such as wood pellets or agricultural waste.|Houses in the UK are heated by a variety of fuels, which include gas, electricity, oil, solid fuel and LPG boilers. Each fuel has a varying cost associated with it and that means you can find yourself with cheaper energy bills by switching how your home is heated. Even solar thermal panels are being regarded as by many in order to lower heating bills for the many years to come.